Although my daughter and I love any foods that are heavy on the garlic, my wife can’t eat them. She also needs to maintain a gluten-free diet, so garlic bread is a special treat we make when Mom’s not around. It’s buttery, it’s garlicky, it’s carby, and it’s absolutely delicious! 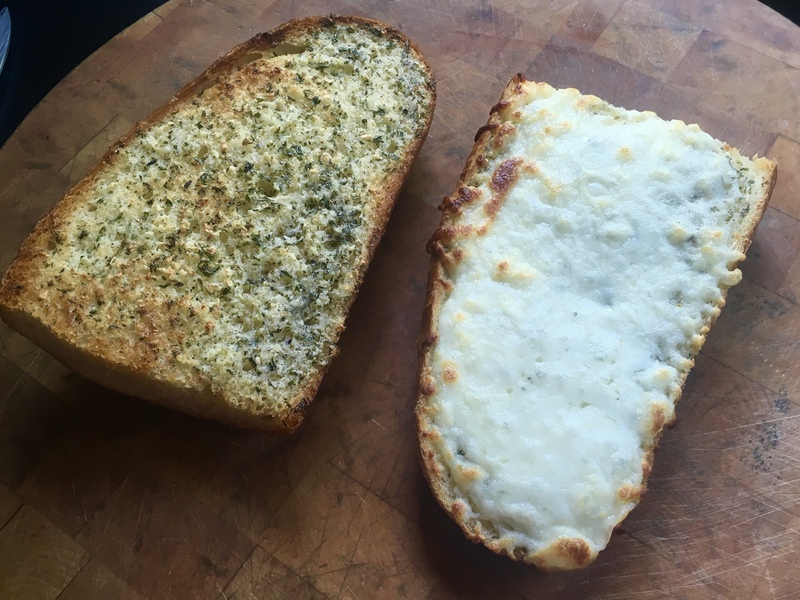 I use 2 kinds of garlic in my garlic bread: fresh and granulated. I think it adds a richer flavor than either one alone. And passing the fresh garlic through a press ensures that it will cook quickly and not leave you with that raw garlic taste in your mouth. Although I love French baguettes, they’re too thin and crisp for garlic bread. I buy that long, soft, Italian loaf you can find in just about any bakery. 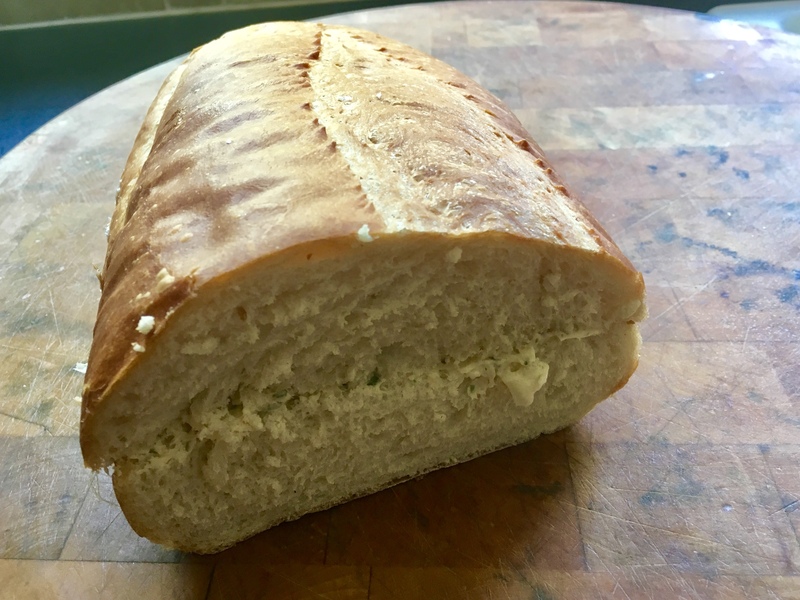 When it bakes, the outside edges have a crisp bite to them, while the inside of the loaf stays soft…exactly what you want! The Italian loaf is big, so not only do I cut it lengthwise, I then cut each piece in half. This will make enough for us to enjoy one evening, and still store some in the freezer for a future craving. 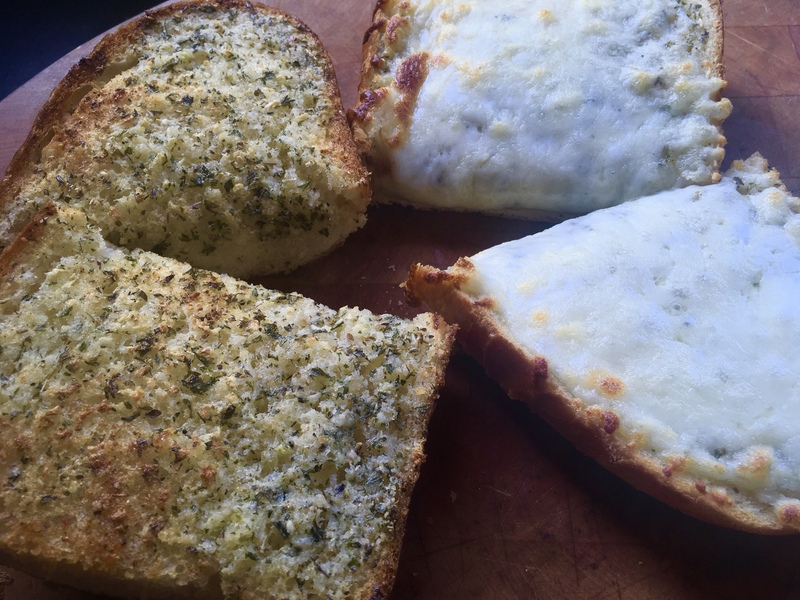 This recipe makes enough for 1 garlic bread, 1 cheesy garlic bread, and also the bread you’ll be putting in the freezer for another time. Spread the garlic butter evenly on all 4 pieces of bread you’ve cut. Use it all up! Going thin on the butter serves no purpose here! Place one of the loaves on a baking sheet. Add the grated mozzarella to one of the other loaves, and place it on the baking sheet as well. 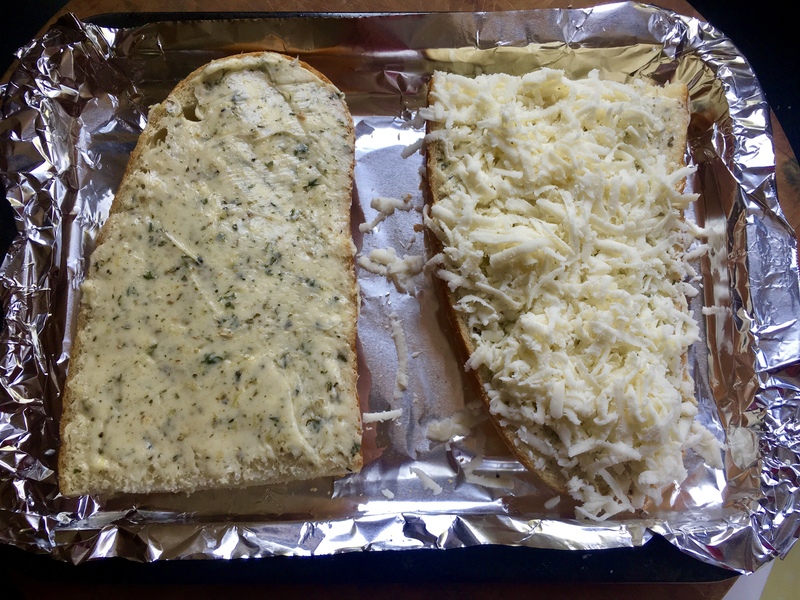 Regular garlic bread on the left, cheesy garlic bread on the right…ready to go into the oven. …and wrap them in aluminum foil. I place that in a freezer bag and keep it frozen until we have another craving. When it’s time to cook, I pre-heat the oven to 350, and bake the loaf in the foil for about 25 minutes. I take it out of the foil at the very end and bake another 5 minutes to get it to crisp up. 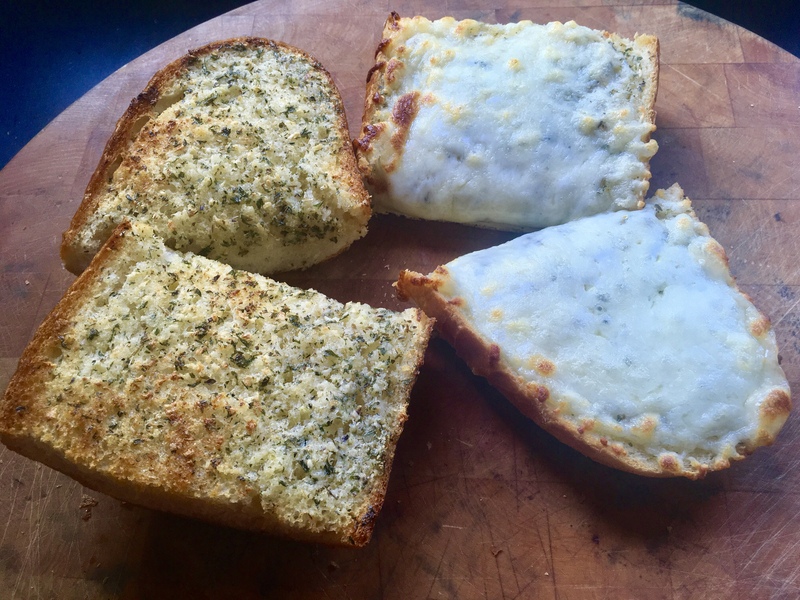 With the oven at 400, I bake my garlic bread and cheesy garlic bread for about 10 minutes, or until the edges of the bread start to turn a golden brown and the cheese on the cheesy side starts to melt. 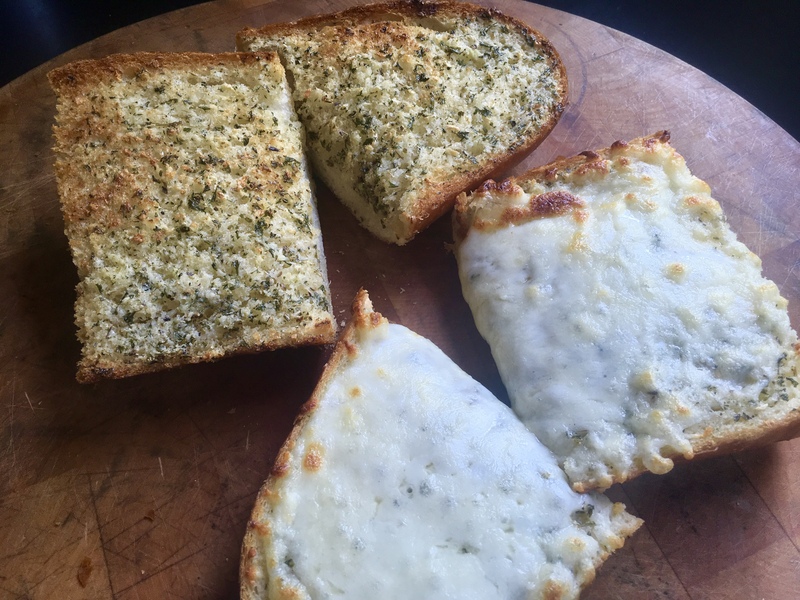 I cut each piece in half so my daughter and I share in the 2 breads. There’s never any leftovers!